Come and Enjoy our New Meeting Place! 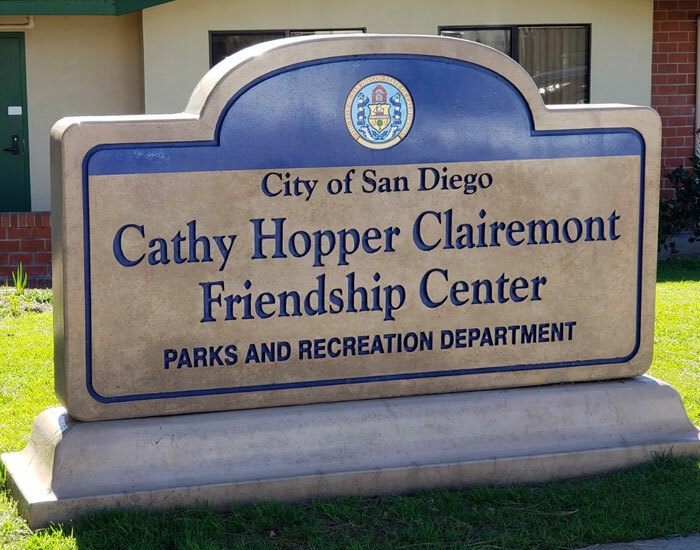 Since March, the SPMA has been meeting at the Cathy Hopper Clairemont Friendship Center. The address is 4425 Bannock Avenue, San Diego, CA 92117. There are more pictures in the Assay. Click this link to make your own Google Map with directions. APRIL ASSAY NEWSLETTER - Now Available On-Line! Click the link to view and read your latest ASSAY, with full color pictures. Assay Newsletter-April 2019 . Previous issues of the Assay can be found at the bottom of the Library page. You'll need Adobe Reader to view the file. If you don't have it, you can download and install it using this link. Adobe Reader. Members Michele Ashton, Patrick Ashton, & Lee Darling will give mini lectures on how they make separating the gold from dirt concentrates go quicker in the field. Come and learn their tips and tricks! Patrick & Michele will present Thompson dry washer/puffer, home made puffer (Sam Radding brand), home made trommel (mikes trommel), a mini recirc sluice & a homemade wet system for dry areas proven to work at Starlight & Potholes. New Email System - Sign up to have The Assay sent to you! To better communicate with our members, the SPMA has decided to create a comprehensive email list. Our new email management system will allow us to email the monthly Assay at a great cost savings. To sign up, just go to the Contact web page and fill out the 3-line form. This is a good thing so please sign up. If you wish to, you can always discontinue SPMA emails by clicking on the "unsubscribe" link at the bottom of each email. The Assay will still be posted on the SPMA web site each month. A few printed copies will be available at the monthly meetings but we will no longer be sending printed Assays out by regular mail. We are on a tight budget. For those who haven't been there before, we will meet at the intersection of Hwy 395 and Osdick Road at 9:00 a.m. Friday April 19, 2019. If you're arriving on Saturday April 20th, we will meet at the same location, again at 9:00 a.m. From there we will tour the claim. Please see the March Assay for more info. We will meet at the Buckman Springs Safety Rest Area at 8:00 a.m. Saturday, May 25th. From there you will be guided to the Starlight claim. Please see the March Assay for more details. SPMA members are encouraged to add photos to our photo page slide shows. Albums (or folders) have been set up in our Photobucket account for each month of 2018. In many cases the web manager has already created a slide show link to our Photobucket account. For example, you can share the photos you took at the Christmas party by uploading them to the Christmas Party slide show. To learn how please click here: PhotoBucket Instructions. If you have questions please contact Tom Heffernan via email. Our next hunt will be Saturday April 20th, rather than Sunday because Sunday is Easter. So, we'll meet on SATURDAY at Mission Beach by the big parking lot south of the roller coaster first thing in the morning. At 10:00 we'll get together at a picnic table to show our finds. Should you have any questions call Frank Trutta at Columbia Metal Detectors, 1-760-743-8516 or call his cell phone 1-760 291-7900. You'll find a summary of the last hunt and more info in the Assay. Happy hunting! Our next general meeting will be held at 7:00 PM at the Cathy Hopper Clairmont Friendship Center, 4425 Bannock Avenue, San Diego, CA 92117. This will be our first meeting at this new location so come check it out. Click this link to make your own Google Map with directions. Hope to see you there. The Imperial Valley Chapter meets on the 2nd Saturday of each month at 9:00 AM, at the Potholes Claim, except during the summer. For more info please contact Jim Perkey via email. Our monthly SPMA Board of Directors meetings are held on the second Monday of each month at 6:30 PM in the Gem & Mineral Building, Spanish Village, Balboa Park. All members are welcome to attend. We now have two types of claim forms, a Mail-in Claim Form. and an Email Claim Form. Just click the links for each to check them out. We hope that by making the forms quick and easy to use, more people will send them in. Collecting these Claim Use Forms is important because it shows the BLM that we are actually using our claims. It also shows that we are being responsible stewards of the land. Hauling away old trash and filling in dangerous holes also shows that we're pretty good people to have around. When we apply for new claims, the BLM takes all of this into account. Check out this recent Union-Tribune article by Gary Warth. He tagged along with trip leader Lee Darling on an SPMA outing to our Potholes claim in early April. Just click the links and enjoy! Article and photos. If the link should break, here's a PDF copy. It's time you knew what the PEW Environment Group is up to and how they are lobbying to change the laws that regulate prospecting and mining. Download their 38-page booklet and read their own literature. PEW Environment Booklet. If you're attending your first SPMA meeting you should know that pizza, snacks, and beverages are available at all our meetings at very reasonable prices. Profits support the association.